We talk with the Austin, Texas pitmaster and owner of Franklin Barbecue about his upcoming event with Renee Erickson in Seattle, his second annual food fest, and good old grunge music. The barbecue whisperer himself, Aaron Franklin. 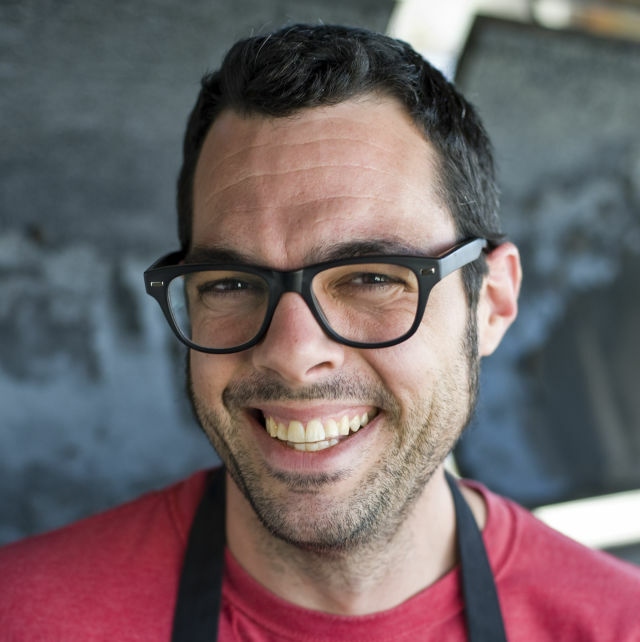 Aaron Franklin is arguably the most well known name in barbecue these days. His Austin joint, Franklin Barbecue, is lauded by folks from damn near every corner of the country and beyond. With many a barbecue award and a James Beard award under his belt, this verifiable barbecue nerd authored a meat manifesto, founded a food festival, and even has a 'cue-centered web series. And come May 10, he'll be in Seattle slinging brisket alongside Renee Erickson at La Marzocco Cafe. In light of his visit Nosh Pit chatted with the chief firestarter. So you'll be in town on May 10 for an event at La Marzocco Cafe with Renee Erickson. What's that all about? Well our friends, Cuvée Coffee, are based in Austin and this is the first time La Marzocco Cafe is featuring a roaster from Texas. They're friends of ours so it seemed like a pretty easy thing for us to pull off and help kick off their [coffee residency] launch party. I'm going to do brisket carnitas tacos with some salsa, super simple. And Renee Erickson will be at Hot Luck Fest in Austin, Texas (May 24–27), right? Absolutely. We're actually building a really cool Umbrian grill for her right now at our welding shop. She kind of designed when she was in Austin not too long ago. And it's pretty much just a giant fire ring. The Umbrian part of it is where you burn the wood in a cage and the coals fall down, then you rake them under the grate constantly. It's looking pretty cool. Yeah, she's coming to Hot Luck and it's super exciting to work with friends—that's how all this ties together. I'm not asking chefs to do fancy food to put on white tablecloths, the little white plates. We're like, Well, what do you want to cook? All right, let's figure out a way to make that happen. Even if it's hotdogs. All right, great. Let's grill hotdogs. And we'll just make 'em the best darn hotdogs anyone's ever had. This is year two of the festival. Is there anything new this year? The idea is that we just make it better each year without making it feel big, like we want to keep it small, keep it comfortable, keep it super backyard style, and you know, super tailgate-y. We have a brunch event that we're pretty excited about and Austin's not much of a brunch town. It's not like up there—gosh, people love brunch further outside of Texas. Music's a big part of the fest, and like Austin, Seattle's a major music city, too. Do you have any favorite Pacific Northwest bands? Oh, boy. That's a fine question. Of course I'm a big fan of the The Wipers. I like Big Business quite a bit. There's a band from Olympia that I like, they haven't played in ages, but a band called C Average. Just a bunch of stuff no one's ever heard of, really. I used to play music a long time ago. I used to tour and we would always come through Seattle. We always had such great shows in Seattle—we used to play at Crocodile Cafe a fair bit—it was one of my favorite places to play. Lastly, what's on the Seattle agenda? I can almost guarantee we're going to hit up JuneBaby for one night and at least a couple of Renee's restaurants. In year three of the cafe's Roaster in Residency program, La Marzocco brings in Austin roaster Cuvée Coffee for May. And to get things started right expect—what else?—a Texas-style party from 7–10pm. Aaron Franklin will bring the brisket tacos, while Renee Erickson's got your pickled clam and oyster tostada needs locked down. Also: scoops of Molly Moon ice cream, Cuvée cold brew, Flavor Country Pale Ale from Austin Beerworks, and a selection of Washington State wines. The event, alas, is invite-only but there's a glimmer of a shot, per a La Marzocco blog post, "To receive an invite, guests must be signed up for our Locals Newsletter." Godspeed and good luck.